ST PETERSBURG, Russia, Aug 6, 2015 – The Apple Company is famous around the world for its electronic devices: desktops, notebooks, tablets, and smartphones. In 2015, the Cupertino manufacturer presented the Apple Watch, a smart device capable of acting as a real personal assistant in its owner’s everyday life. It can be used for sports and fitness, communication via SMS and email, or to run a variety of tools from the App Store. When you think of trendy gadgets, you probably don’t think of machinery production. 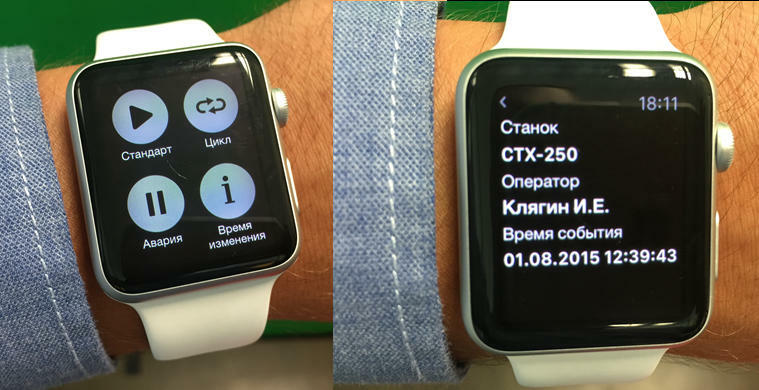 The LO CNITI Company (Saint Petersburg, Russia), a pioneering developer of automated control solutions for computer numerical control (CNC) machine tools, considers smart accessories one of the most promising areas of the electronics market, and is celebrating the launch of the Apple Watch in Russia with a demonstration of the world’s first native Apple Watch application designed to provide real time information about the operation of a set of machine tools. When the program is launched, the watch displays a list of accessible equipment that the user can scroll through with a finger or the Digital Crown. The user sees the number and designation of each machine tool, and can tap the color-coded box that indicates the current status of a particular tool (cycle, accident, adjustment, etc.) to reach a screen that displays further information about the operator and the task the tool is handling. Pressing more firmly on the display switches the application to event sorting selection mode. For example, if the user presses the “ALARM” button, the machines with active ALARM signals will appear at the top of the list. In this way, the foreman of a particular production unit or the manager of an enterprise interested in centralizing monitoring of equipment and personnel can now access the necessary information without looking farther than their own wrist, from anywhere in the world, with an iPhone and an internet connection. The new application is already available from the App Store for all users of the Foreman hardware and software suite. More detailed information about the product is available on the site: http://monitoringcnc.ru/. The Foreman hardware and software suite automates the process of monitoring production equipment and personnel, enabling enterprise managers to receive prompt analytical information about the efficiency of CNC machines in the shop. More than 50 Russian enterprises use Foreman to monitor and improve the efficiency of their production processes. Further information is available online http://locniti.ru/.